Tony Ulwick is the pioneer of jobs-to-be-done theory, the inventor of the Outcome-Driven Innovation® (ODI) process, and the founder of the strategy and innovation consulting firm Strategyn. 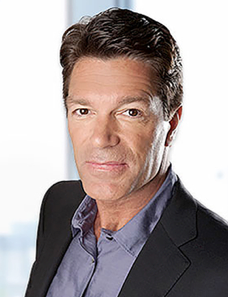 He is the author of Jobs to be Done: Theory to Practice (IDEA BITE PRESS) and “What Customers Want” (McGraw-Hill) and numerous articles in Harvard Business Review and Sloan Management Review. Here’s a relatively new concept that is sweeping across the radar of brand managers across the marketing world: micro-moments. Introduced to us by Google’s Sridhar Ramaswamy, micro-moments are the moments or instances when we turn to a device—often a smartphone—to take action on whatever we need or want right now. These I-want-to-know, I-want-to-go, I-want-to-buy, and I-want-to-do moments are loaded with intent, context, and immediacy. Google’s advice: The successful brands of tomorrow will be those that have a strategy for understanding and meeting consumers’ needs in these micro-moments. Be There. 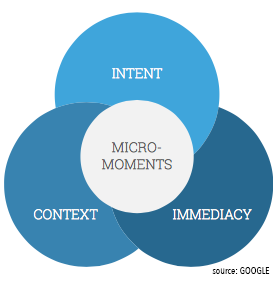 Anticipate the micro-moments for users in your industry, and commit to being there to help when those moments occur. Be Useful. Be relevant to consumers’ needs in the moment and connect people to the answers they’re looking for. Be Quick. Mobile users want to know, go, and buy swiftly. Your mobile experience has to be fast and frictionless. 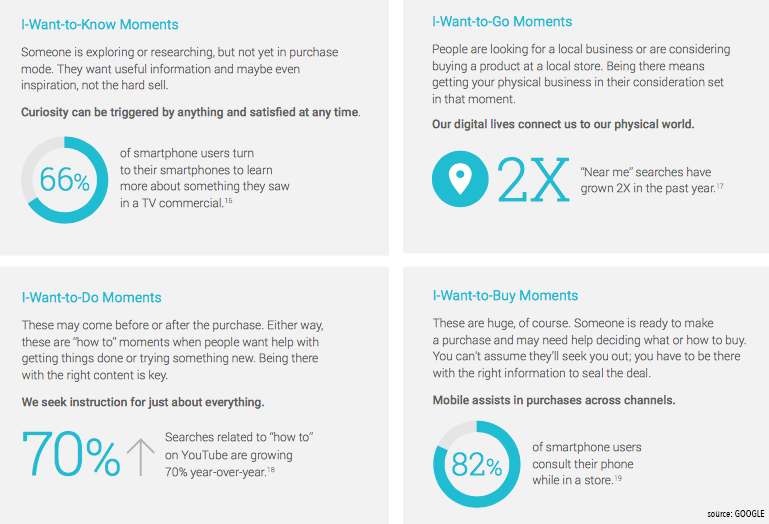 How can businesses apply Job Theory (Jobs-to-be-Done) to micro-moments? The Jobs to be Done Needs Framework introduces the types of customer needs that must be considered to gain a deep understanding of what a customer is trying to accomplish. 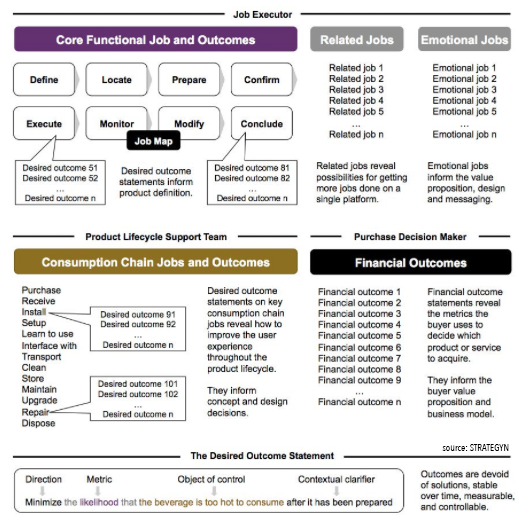 They include (i) the core functional Job-to-be-Done, (ii) the desired outcomes tied to the core functional Job-to-be-Done, (iii) related jobs, (iv) emotional and social jobs, (v) consumption chain jobs, and (vi) the buyer’s financial desired outcomes. While a job describes the overall task the customer is trying to execute, an outcome is a metric the customer uses to measure success and value while executing a job. For every functional and consumption chain job there exists a set of up to 50 or more desired outcome statements. Knowing all the customer’s needs in a given market dramatically changes the way a company approaches the innovation process. With a complete set of customer needs in hand, a company is able to discover hidden segments of opportunity, determine which needs are underserved and overserved, decide which strategies to pursue, simplify ideation, test concepts for their ability to get a job done in advance of their development, and align the actions of marketing, development, and R&D to systematically create customer value. With knowledge of all the customer’s needs and which are unmet, a company can predict which new concepts and offerings will win in the marketplace. Evaluating a new concept against all the needs (when those needs are defined as the metrics customers use to measure value when getting a job done) will reveal how much better a proposed concept will get the job done. Because customers are loyal to getting a job done, customers will switch to new solutions when they are able to get the job done significantly better. In our experience, new products that get the job done 20 percent better or more are very likely to win in the marketplace. Knowing that a product will get the job done 20 percent or more is the key to predictable innovation. Analysis of hundreds of jobs has revealed that all jobs consist of some or all of just eight fundamental process steps: define, locate, prepare, confirm, execute, monitor, modify and conclude (the “universal job map”). Add to this what we call consumption chain jobs. After a product is purchased (which is a separate job), it must be received, installed and set-up. Then someone has to learn how to use it and interface with it. Someone may also have to transport, clean, store, maintain, upgrade, repair, and dispose of it. 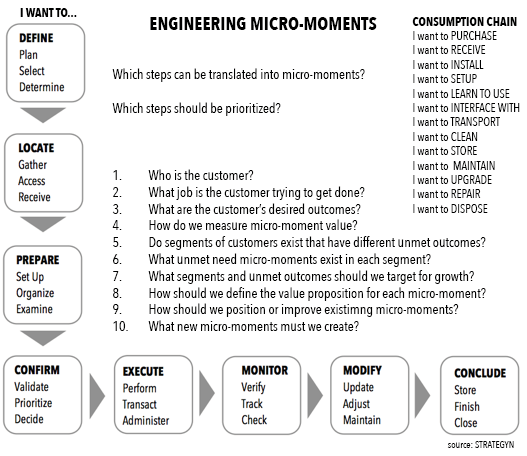 While people don’t buy a product so they can clean, repair and dispose of it, a company that engineers winning micro-moments along one or more of these dimensions could differentiate itself in the marketplace. Do not define the Job-to-be-Done as a situation that a customer finds himself or herself in. Rather define the micro-job around what the customer decides to do in that situation. For example, commuters may find themselves “on a long, boring commute”, but “having a long and boring ride to work” is not a job—it is a situation commuters find themselves in. You cannot study the job of “overcoming boredom” because it is not a functional job. You may find yourself bored waiting in line at a doctor’s office, but again, overcoming boredom is not the job, nor is the job to “fill my time while waiting”. Rather, what the customer chooses to do when she/he is bored is the real Job-to-be-Done. For example, when you are standing there in line waiting to see the doctor, you may choose to use your smartphone to “stay informed on topics of interest”, “check your credit score”, “pay bills”, or execute other jobs that can be accomplished through a smartphone application. They are the Micro-Jobs. And yes, they may be viewed as potential micro-moments in which your company could engage with the customer.